Translation of Ballantine Ad: LEAVE YOUR MARK / Alcohol Abuse Is Detrimental To Your Health. Consume In Moderation. 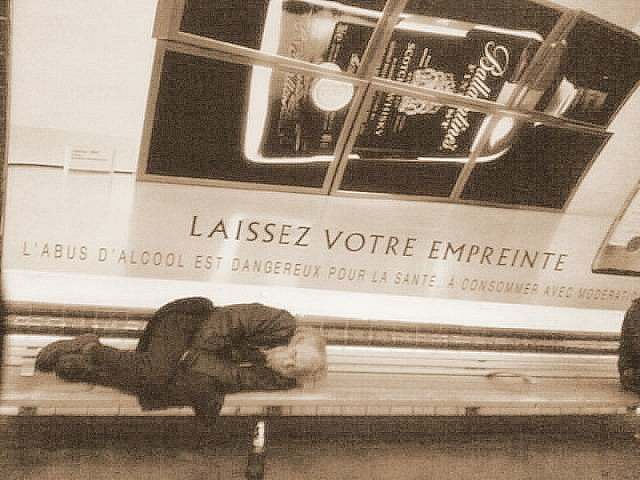 One of my readers somewhere in France sent me this photo, complete with the English translation of the billboard. This entry was posted in Alcohol, Help Wanted (Photos) and tagged Alcohol, Ballantine's Scotch Whisky, drinking, drunk photo, help wanted, homeless, Humor. Bookmark the permalink. True, but the booze is also making him Leave His Mark on the bench. Everything’s a trade-off. It’s a really poignant photo that your, ahem, reader captured, Al darling. I love the irony it it, the sadness of it, the contrast with the ad for a pretty expensive whiskey and this impoverished alcohol abuser. It’s a gem of a find. One of those serendipitous moments, i guess. Everything musta fallen into place for St Paul-i at just the right moment.